The graphics and keyboards have changed from blue to grey and the font is now a more pleasing style. Keys are now larger and give visual feedback on a press. The alphanumeric entry has changed from a single ‘squashed’ keyboard to a dynamically changing one which can be flipped from a numeric to an alphabetic layout. An auto-swipe entry can now show the entered data and any validation message on a region at the bottom of the GUI idle screen. A screensaver facility has been added. 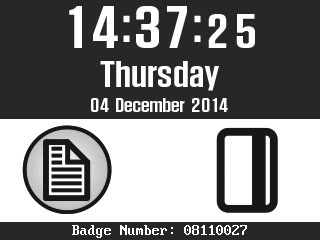 After a predefined time-out, the idle screen is replaced by a fixed graphic. The screensaver is terminated on seeing activity. By default, the graphic is a Feedback logo, but this can be replaced by a suitable image sent to the terminal via the TCP interface. The brightness of the display back-light can be changed from full to dim. A new bar-code decode for Interleaved 2 of 5 has been added along with a Wiegand 34 bit decode for iEvo biometric readers. NOTE: All changes can be applied to existing FAMS TS2020 terminals using a software upgrade procedure. If the changes are not required, for instance where a site already has existing terminals and they wish to retain the same look, there is a software package that adds the new features only.